This month we get to introduce you to another very special associate. Meet Lee Showalter! He is our Bulk Wire Maintenance Manager located out of Kalas’ Plant 2. This past June marked his 35th anniversary here at Kalas. His 3.5 decades willingly learning and operating so many of our machines has made him a resident expert and perfect fit for the role he fulfills today. 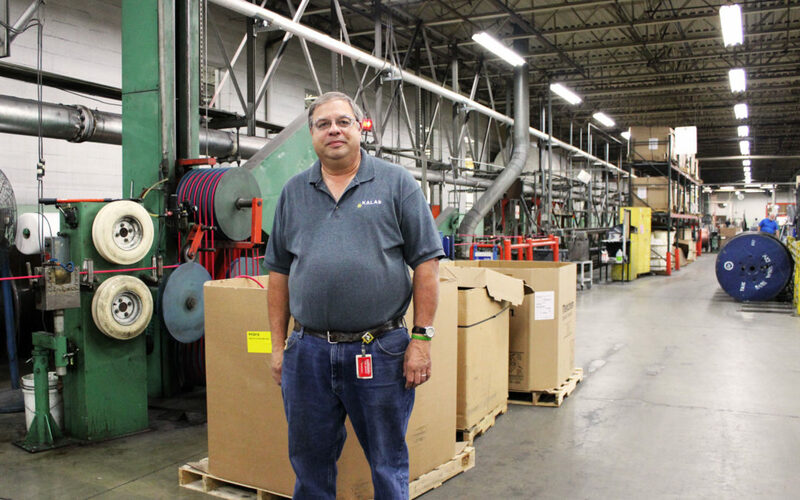 Lee’s career began in 1983 as an extruder operator running extruder 8 on 2nd shift in the sole plant Kalas had at the time. When extruder 10 was installed the following year, Lee transitioned to the 3rd shift operator of that line. That would be the first of many extruder operator machine and shift changes for Lee. A few years after that first transition, Lee returned to running extruder 8 on 1st shift, followed by extruder 14 when that machine was installed. When Kalas second plant was built, Lee followed extruder 14 to the new building and worked from there. In the late 90’s he aptly became an “extruder specialist” operating all extrusion lines as needed. In the 90’s he also applied for and landed an assistant supervisor position on 1st shift. In that role he began getting involved in maintenance and started taking classes leading to him into a supervisor position and ultimately to his current position at the bulk wire plants. Lee has seen a lot of change, added buildings, machines, people and shades of growth in our company which many new Kalas family members will only learn about from walking and talking with him. When you talk to Lee about what he does today, it is visible he is a great fit for exactly what he does. Currently as the Maintenance Manager for our Bulk Wire division he floats around fixing whatever issues arise. He is in charge of keeping machines up to date, ordering needed parts, ensuring buildings are safe, running well, and continuously improving. He has an aptitude and inclination toward figuring out and fixing things. Most noticeable is his desire to lend a helping hand when he sees a need. Being someone who himself rose through the company from machine operator to where he is today, he values “not forgetting where you came from” and helping each and every associate who needs assistance on any line. His background is his gift to having the knowledge and skill he needs to help out. Over his years he finds memories of Kalas picnics and parties to be some of his favorites. The yearly get-togethers where his coworkers would come with their families to play games and enjoy time outside of the work place made for quality community and memories. Kalas’ recent 60th celebration was a new memory he valued as he got to see several retirees from years past. Lee really values his job here. He enjoys working with the equipment, the suppliers, and making improvements. The variety of work and energy of being available to attend to whatever rises on the floor which needs worked on are qualities he enjoys. He enjoys keeping in close contact with the maintenance associates and operators who actually know how machines are running on a day to day basis. Kalas has been a great organization for Lee over the years and he finds connection and sees much positive in his history and present here. Join us in thanking Lee for his commitment, his hard work and his willingness to help! Thank you Lee for being a valued part of our Kalas family for so long! We are grateful for your presence and service.